Starting out the day with a ride in a new SXS, a chilly temp and a background of majestic mountainous views is always grand but getting some real time Honda Talon X seat impression for a full day makes it even better. 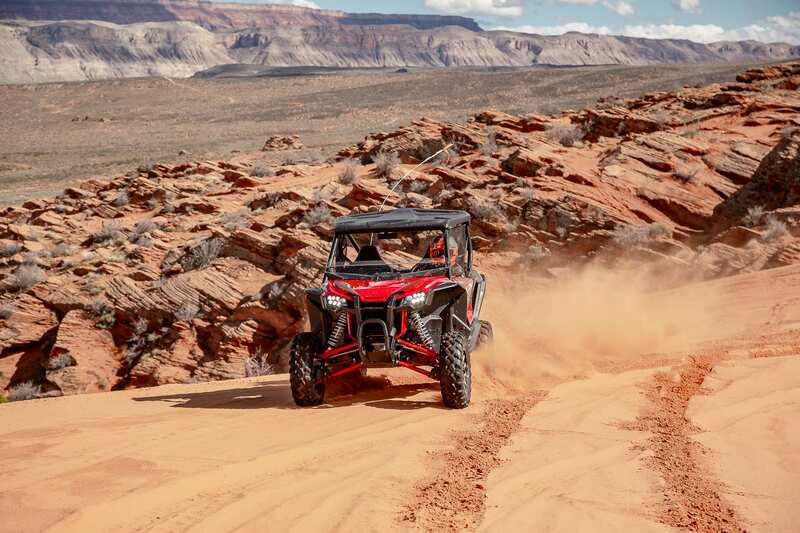 The 2019 Honda Talon X is heading to the dealer floors now but, just a few weeks ago we had the opportunity to ride this rig in the mountains of Utah. This 64-inch version of the Talon is built for all ground but works well in tighter trails and in those areas where trail width could be limited or mandated to a specific width. Our riding location just happened to be right down the road a piece from the Coral Pink Sand dunes in Kanab Utah. This trail head is located just off of HWY 43 on the backside of Mt Zion national park. Known as the Barracks trail this BLM trail 20 offered up some open runs of sandy washes with winding berms and also some steep climbs both in and out of the big valleys on the southside of Mt Zion National park. 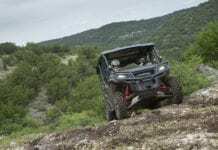 We found ourselves driving through serious ruts and washed out sections of trail with a few stops along the way to get a short peek into the natural landscape. Now that we have set the stage for our ride lets dig into the new Honda Talon 1000 X and its features for the loyal riders of Red. 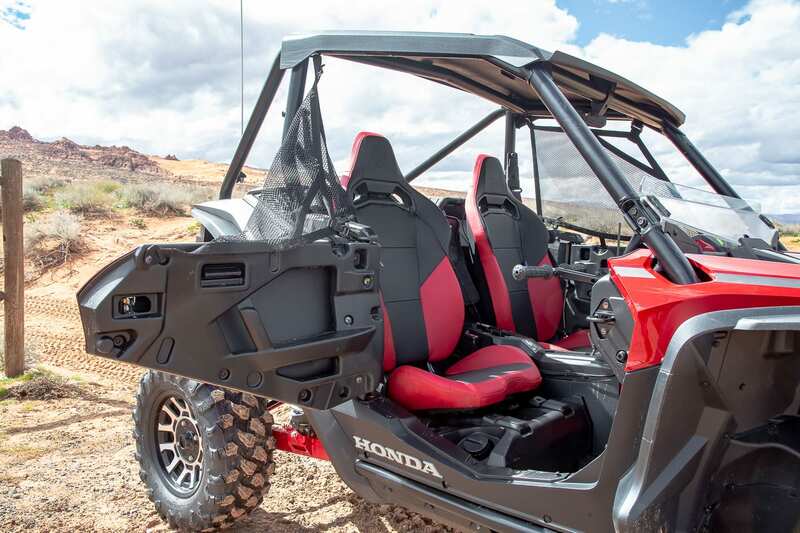 Looking at the 2019 Honda Talon X from the front you might immediately notice the large semi-bolstered seating peeking up over the dash. It is when you slip down into these seats that you realize you are at home. Some taller riders might have a tad bit of issue with not enough leg room but for this 6ft tall gent there was not really any problem. I would say it could have been from the sheer excitement of riding the Talon for the first time but even after the mornings 4-hour session it was not a concern. These seats are also ready for those, more “race inspired” drivers to add an aftermarket 4-point harness right from the start if they so choose. During our ride on the trails our three-point harness did seem to work well. It was not intrusive, nor did it feel like it was digging into our shoulders as some tend to do. The belts also did not lock out or become annoying during hard stops or starts or even during the many high-speed bump sections. The seating could use a bit more bolstering for added side grind or input in tight corners but overall the fast, berm filled cornering left us feeling like the containment was well done. The drivers seating position also gave us confidence that we could ride for extended periods without feeling exhausted from the way you had to hold the wheel. The driver seat is manually adjustable to a point and if it went back another inch or so it wouldn’t hurt our feelings at all. As you look around the cockpit of the Talon X you immediately notice many small buttons and switches all which have specific duties in making your ride in this machine to your liking. The steering wheel is shadowed by the twin paddles which control shifting duties at some point during the ride. Whether it is up shift on the right or down shift on the left you can always control what gear you are in with a simple scratch across the wings. This tilt steering is also adjustable to most any riders driving style or size. 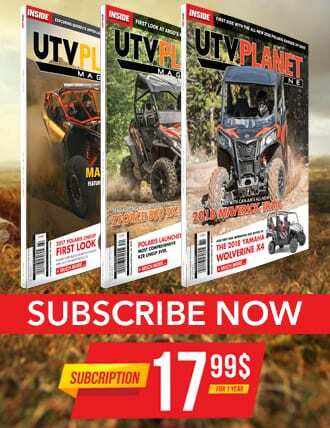 Speaking of shifting you already know that the Honda DCT or Dual Clutch Transmission is the connection between you and the ground you are riding on. This complex design has garnered Honda a very unique way to put the power to the tires and gives the driver the choice on how to do that. By staging gear sets to “be ready” before you even realize it the transmission anticipates how it will engage the next gear. Reading how your throttle foot is positioned as well as how you engage the throttle during the ride really dictates just how the machine will shift. If the factory shift points seem to come together a little too soon then you just stick a finger out on the left or right and change the gear back down or even up for that matter via the paddles. If you want to hear the engine gain a little more RPM (thus bringing it into more of the Uni-Cams power profile) you simply press the console mounted switch up again while in AT mode and it gives you a sport mode. This simply holds the shift point a little farther up the RPM range and builds on a little more adventure for the driver. We found that either of these methods worked well. The Sport shifting can be over ridden as well, again, with the paddles but our riding setting for the day was mostly Sport mode. When the trail would stretch out and give us some room to think AT was the choice with our digits always ready to take on any challengers. 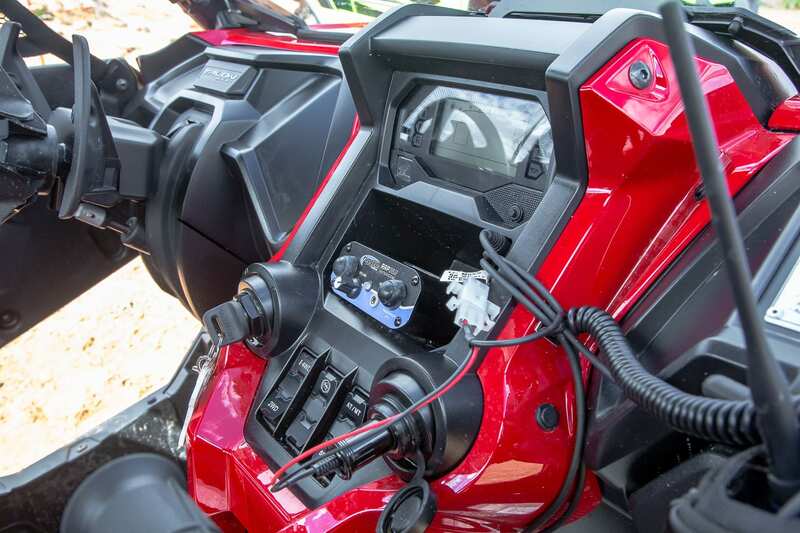 Allowing your eyes to drift across to the middle of the Honda Talon X you will find the main control center and digital readout for those specific instruments you might want to keep an eye on. The rocker switches for i-4WD/2WD, Hill Start Assist and Auto to Manual transmission including Sport mode are located in the center of the console well within view as well. The dual cup holder at the rear of the center console will contain your beverage until you need it as well. All three of these switches control vital engineering advancements that Honda has worked hard on to develop for you the consumer. Let’s lay those out individually. The advent of i-4WD came to the market with the Pioneer line of SXS and it is sometimes taken the wrong way just because it is misunderstood. 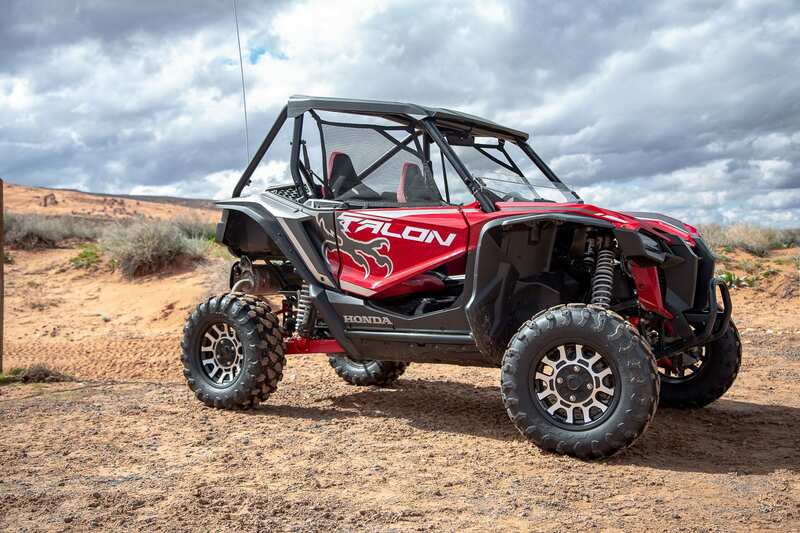 We agree that if you hear an engineer speak of the details on this feature it can be overwhelming but simply put, the Honda Talon X uses the i-4WD to transfer more power to the high traction wheel by electronically braking on the low traction wheel. It automatically gives more power and focus to the wheel that’s getting the work done. When engaged, this happens so seamlessly that you may or may not even notice. During many of the slower sections of the Barracks trail we had to strategically navigate the rocks and steep ditches where the chassis of the Talon was stretched out across the open air several times. With very little to get a grip on to the Talon would carefully engage the wheel with the most traction until the opposing side was able to get a bite of the ground again. 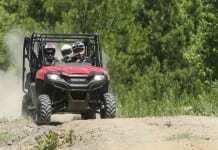 This meant that very slow crawling, just like our experience in the Talon R on the rocks at Sand Hollow, was almost invisible. The only thing we felt at times was a little rocky engagement or gear on gear bump as we pressed harder yet smoothly into the throttle right off the very bottom. 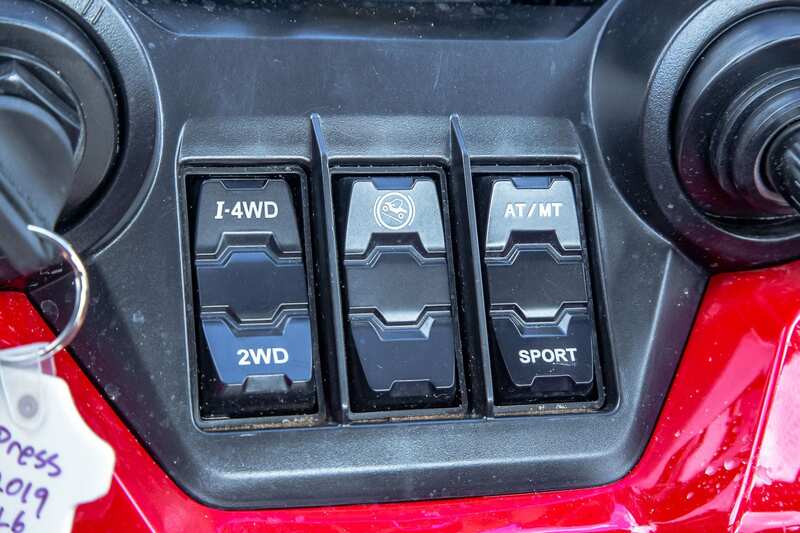 Another of those crazy switches controls your Honda Talon X in case you get stuck or stall in the middle of a hill climb and need to be strategic in how to get your foot from the brake pedal to the go-pedal. Simply pressing the brake pedal and then the hill start assist button engages or locks the brakes for just a few seconds so you can then move over and give the big 999cc mill some fuel to get going. This might just be the saving grace for those times when the least experienced driver in the family decides to take the wheel and bump you to the co-dog seat. Speaking of the power plant, which could possibly be the hottest topic in the entire industry right now, we were able to stretch the legs of this machine several times. Although some may consider the crank number of 104hp to be behind the current offerings in the market we felt as if the engine performed very well with all things considered. The response from low range to the middle of the throttle was responsive and felt very sporty. As the rpm and speed would climb past ¾ throttle there were not any big dramatics from that point although the engine would continue to accelerate. One thing is for certain, the power delivery is smooth and fits this chassis perfectly. We were at approximately 5500 feet in elevation and as with all N/A motors you lose some power due to elevation and loss of oxygen. Is there room for more? We would be very wrong to say anything but, Absolutely. Is it fun as hell to drive like it is? Your damn right it is. Something most consumers will not realize is that most of these late model engines in the market may have a higher rated crankshaft measured HP but the biggest portion of that is well into the high range of the engines RPM range thus leaving most with only bragging rights because they will never see the extended use of that power on the trail. 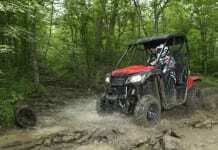 The Honda Talon X four-stroke naturally aspirated mill is well suited for the platform to which it is mounted. 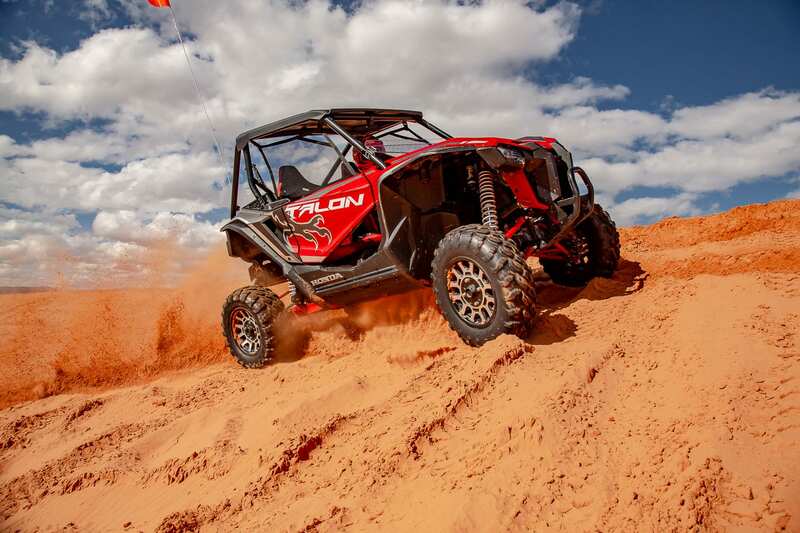 So how does the Talon X handle the trails? There is a clear difference between the Talon R and Talon X on the rear of the machine not to mention the Talon X is the narrower of the two at 64-inches. 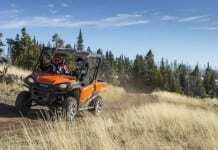 The three-link suspension with radius rods and trailing arms on the rear combined with the dual a-arms up front make the Talon X handle like it is on rails. The FOX Podium 2.0 shocks with the QS3 adjusters not only make tuning the shocks very simple for the average consumer but it was our experience that even in the softest setting during the day the subtle bumps were soaked up and the really hard hits seemed to take care of themselves as well. We did have at least two good g-outs during the ride at higher speed that might have squished the bump stops but nothing alarming. 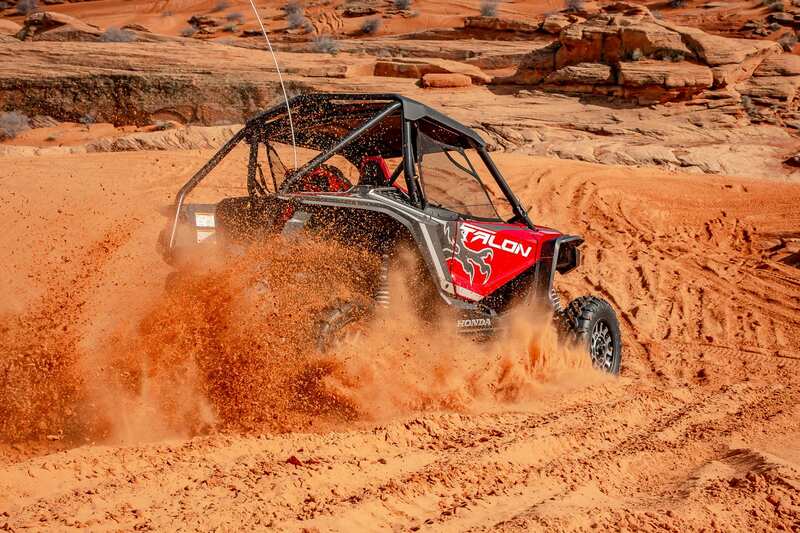 As we mentioned before the winding sharp corners with well-established berms in both directions gave the Talon X a work out but if one thing was clear, this chassis just soaked it up while never feeling out of control or tippy at any point. It was simply amazing how well this narrower vehicle handled.